We are happy to present this years Kim Diehl’s Whatnot’s Club featuring her new line, Wit and Wisdom. 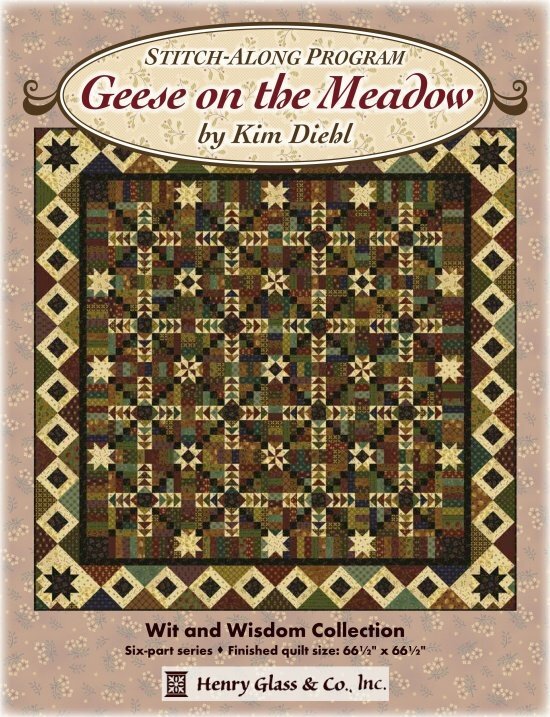 Each month we will offer the wonderful projects from Kim Diehl as well as the main project, Geese on the Meadow. With your paid membership fee of $40.00, you will receive the patterns for all projects. The club meets the third Thursday of each month, beginning January 17, 2019. We have a morning session that starts at 10:00 a.m. and an evening session that starts at 7:00 p.m. During the lecture meetings we highlight our new arrivals at the shop, demonstrate a quilting technique, introduce our quilt project of the month and our block of the month, complete with tips and tricks for our projects, and door prizes. Show and Share from our club members is always welcome and enjoyed. Club members will enjoy a 20% discount on their purchases the day of club. Please fill out the registration form to reserve your kit. A few extra kits may be available on club days. Kits do not include backing. Eighth in the series! Henry Glass and Kim Diehl bring you the seventh collection of the loved Simple Whatnots Club, featuring Kim's new fabric collection Wit and Wisdom. Kim has created EIGHT new simple and beautiful miniature quilt patterns exclusively for this club. All eight miniature quilts are quick and easy to complete using basic quilting skills. These little miniatures are perfect for decorative wall hangings and table toppers! Apple Baskets - finished size 16½" x 16½"
Frugal Farm Wife - finished size is 18½" x 24½"
Charm School - finished size is 21½" x 27½"
Hen House Stars -finished size is 16½" x 24½"
Lickety Split - finished size is 18½" x 24½"
Smack Dab In The Middle - finished size is 24½" x 24½"
Potting Shed - finished size is 28½" x 28½"
Wind Spinner = finished size is 20½" x 20½"
All eight miniature quilt patterns and instructions. All fabric needed for the 8 miniature quilt tops, including borders and binding. Fabric is fromWit and Wisdom fabric collection by Kim Diehl for Henry Glass Fabrics. Total cost for all 8 projects, including pattern, borders, & binding is $255.00.